If you are going to get in the wine business, Cary Gott is the guy you want to talk to. He has forgotten more about making and selling wine than we can ever hope to learn. Cary is the fourth generation of his family in the California wine business. It’s been a few years since Cary started as a cellarman for the Napa Wine Company, but along the way, he founded Monteviña Winery, Corbett Canyon, and later ran Sterling Vineyards and Mumm Napa Valley while serving as Executive VP of Production for Seagram Chateau and Estates. Now, Cary focuses on the creation of new wineries and vineyards through his firm Vineyard & Winery Estates. 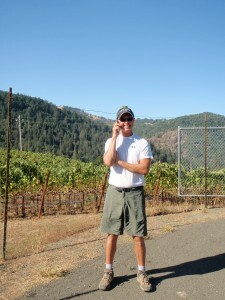 In addition to making wine for Match Vineyards, his clients include Piña, Chappellett, Plumpjack, D.R. Stephens, Renwood, Fantesca, Round Pond, Pillar Rock, and Silver Rose. Cary and his wife, Victoria, live in St. Helena. In addition to Cary’s consulting business, the Gott family is in the food and wine business in Napa Valley and San Francisco with Gott’s Roadside and Joel Gott Wines. It sure is nice to have this Napa Valley maven working in the cellar.